Photosynthesis is vital reaction for our planet. Not only it keeps alive our green landscape, converting CO2 into valuable biomass,but it is also the main source of oxygen in the atmosphere. At the heart of the photosynthetic mechanism, there is one of the most difficult reactions to accomplish. This is water splitting, i.e. the cleaveage of the very stable bonds of the water molecule into its elements, hydrogen and oxygen. For this first step of the photosynthesis reaction, plants use a highly specialised protein complex, named Photosystem II (PSII). It collects the sunlight and uses its energy to split the water through the light-absorbing molecule chlorophyll, and an enzyme that contains manganese, as catalyst. In recent years, the ability of splitting water using sunlight as the energy source became more and more interesting also for technical applications. The possible wider use of fuel cells in, e.g., cars, requires an energy-efficient and environmentally friendly method of hydrogen production from water. 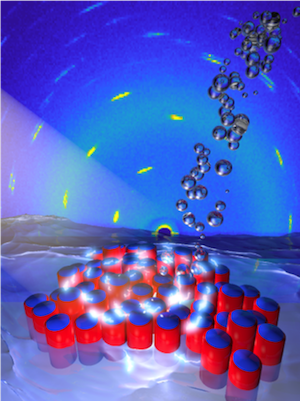 Although nowadays it is possible to chemically synthesise molecules and materials that are able to use sunlight to split water with a similar mechanism as plants do, the efficiency of existing artificial photosystems is way lower than its natural templates. One reason is that in plants, the light-absorbing chlorophyll surrounds the PSII like antennae. Within one antenna, molecules are chemically connected in a way that they can transport the energy coming from the sun via chemical transportation to the core of the PSII, where it can be used for the water splitting reaction. Such a structure, if included in the artificial photosystems, would lead to a considerable increase in the efficiency of these systems. The research team led by Marcella Bonchio from the University of Padua recently made a fundamental step in this direction. In a study published in the prestigious journal Nature Chemistry, an international team of researchers used a new combination of a large light-harvesting molecule of the type perylene-bisimide (PBI) and a metallic catalyser based on polyoxyruthenate (Ru4POM). “We went back at the very first principles of the problem, reading the earliest studies of Emerson and Arnold (1932) and Park and Biggins (1964), and we started our quest for the quantasome particles” says Bonchio. “The quantasome is the minimal photosynthetic unit responsible for the ‘quantum’ solar energy conversion. We made it by integrating a synthetic antenna to capture the solar radiation and a totally inorganic catalyst that can split water using visible light”. The group conducted a complicated structural analysis using a combination of light scattering and small-angle X-ray scattering, both available at the Austrian CERIC partner facility, and found out that the system in water assembles in a structure that is similar to the natural PSII. Complementary tests on the performance in splitting water show an in increased efficiency that is clearly depending on the structure of the synthesised photosystem. This knowledge on how the structure of an artificial photosystem correlates with the photosynthetic functionality is an important step towards the development of photosystems that imitate the natural examples and could lead to an environmentally-friendly hydrogen production in the future. In the picture: Model representation of the quantasome self-assembly into a 2D photosynthetic membrane, showing a biomimetic hexagonal-like pattern of the artificial photocomplexes in water, evolving oxygen upon absorption of visible light.